The Indiana Department of Education has refused to disclose what grades Indiana schools would have received in 2015 if it weren’t for “hold harmless” legislation approved by lawmakers – so I can’t do the analysis of how grades correlate with school poverty that I did in previous years. The best I can come up with is to show how school wealth and poverty correlate with passing rates on the spring 2015 ISTEP exams. And as you’d probably expect, they match up pretty closely. As when looking at grades, I divided school corporations into four quartiles on the basis of the percentage of students who qualified for free or reduced-price meals. Passing rates all around were much lower than in previous years – remember that Indiana students took a new, more difficult version of ISTEP in 2015 – but the pattern was fairly clear. In the top quartile, the schools with the fewest poor students, passing rates for nearly all the schools ranged from 50 percent to 80 percent, with just a few outliers. The median figure – with half the values higher and half lower – was 61 percent. In the second quartile, passing rates ranged from 43 percent to 68 percent. Most were between 50 percent and 60 percent. The median was 55 percent. In the third quartile, passing rates ranged from 35 percent to 66 percent. The median was 50.5 percent. In the bottom quartile, made up of the highest-poverty schools, passing rates ranged from 22 percent to 55 percent. The median was 44.3 percent. As expected, there’s considerable overlap between the groups – schools at the top of the bottom quartile are a lot like schools at the bottom of the third quartile, after all — but the groups line up along the test-score axis, poor schools at the left and affluent schools at the right. There’s nothing new or surprising here, of course. It’s just another illustration of the well-known fact that test scores are largely an indication of socioeconomic status and only secondarily a reflection of school effectiveness. This entry was posted in Uncategorized and tagged poverty, school grades by stevehinnefeld. Bookmark the permalink. It makes me sad that the State of Indiana keeps spending so much money on testing, testing & more testing when we know the results will reflect a zip code. I wish parents would fight back against all the testing their kids are put through at the expense of teaching. The money spent on testing could provide kids with richer education experiences. These experiences are lost when money is diverted to private corporations that supply tests & the hardware needed to take them. Never mind computer labs in public schools are now testing labs. Like I said, sad. Fifty years ago, on Fourth of July weekend, the U.S. Office of Education released a massive study called “On Equality of Educational Opportunity,” which is more familiarly known as the “Coleman report.” Its principal finding, and perhaps the reason the study was released on a weekend when Americans were not likely to be paying attention, was that the strongest predictor of educational achievement was the socio-economic background of a child’s family. This analysis is but the latest to validate that. However, far from suggesting that school effectiveness was unimportant, the Coleman report had just the opposite result. It fueled an effort to find out why some schools seemed to do better with children from poorer backgrounds than others did. That has led to a wide range of proposals to increase the number of children from lower socio-economic groups who are attending “effective schools,” from school bussing to “systemic reform” to vouchers. Needless to say, there is no consensus about which work best. Steve Hinnefeld’s analysis also shows that not all schools with large percentages of children eligible for free or reduced-price meals are performing equally (badly). 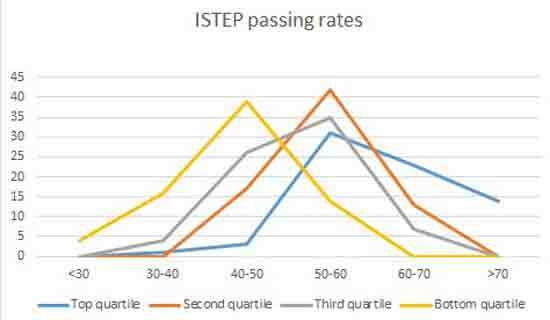 Indeed, a glance at the graph shows that quite a few school corporations in the fourth quartile have higher ISTEP passing rates than their counterparts in the other quartiles, including the top one. (Look at the left-hand side of the graph.) So, the questions we started asking fifty years ago remain germane: Why are some schools that serve children from lower socio-economic backgrounds having educational success? And what can be done to increase the number of these children in such schools?